A nuisance weed may provide a good way to remove arsenic from water supplies in developing countries, according to research carried out in Leicester. 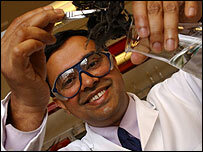 Dr Parvez Haris, of De Montfort University, tested a powder made of dried roots from the water hyacinth. He found it cut arsenic levels in contaminated water by more than 20 times in just minutes to below the World Health Organisation's safe limit. He began research after meeting arsenic poisoning victims in Bangladesh. The World Health Organisation (WHO) estimates nearly 70 million people in Bangladesh are at risk of being exposed to arsenic-contaminated ground water drawn from tube wells. The water hyacinth is known as the "green plague" because it flourishes as a weed and doubles in size within weeks. Dr Haris said more tests needed to be carried out to ensure its root powder could be safely used to filter water. But he added: "This much-maligned but beautiful weed has the potential to be turned into a life-saving material to help some of the world's poorest people."